The first step: dusting... By running high pressure air through the warp and weft, dust and dirt are removed from the rug. 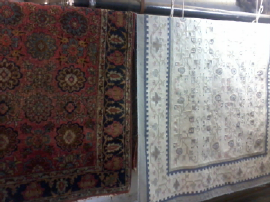 After dusting, the rugs are separated according to fiber, weaving style, age, condition and dyes. 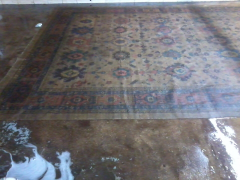 A special cleaning solution is prepared for each rug considering its fiber and dyes. The knowledge of different types of dyes as well as fiber is essential for good cleaning and to avoid color runs. Hand knotted rugs, kilims and Aubussons are brushed by hand. A different kind of brush is used for each type of rug. The fibers of the brush are less resistant to friction than the fibers of the rug, to avoid wear. 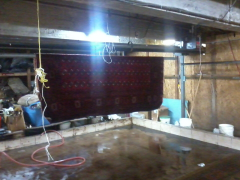 We treat every hand made rug with special care considering its age and condition. Hypoallergenic and biodegradable materials are used only. Artisans of the Loom Inc. is registered in New York City and state as oriental rug restoration and cleaning specialists. We do NOT work on wall to wall carpeting.